I have to admit to something – before I was sent these bars I had already tasted and judged them. It’s hard to mistake the distinctive logo of G&B on bars, plus their distinctive leaf logo and so as the piece of chocolate came my way at the Academy of Chocolate judging session I attended, I knew exactly who it was from. Also I’d had a heads-up that something new was coming so I knew that this must be it. The new bars are thinner to apparently ensure that the flavours come out more distinctly and have more of an impact as the chocolate melts more readily. This taller, thinner bar takes away none of the weight and retains all of the flavour. The four new bars have two traditional flavours and two new flavours. I don’t get the whole hash thing separating the ingredients to denote organic – it is distracting and as someone with mild dyslexia it makes it challenging to read. Still with 3 award-winners in the suite it is going to be a big seller. Well, that’s all well and good but what do *I* think? Milk 37% – There is a trend – and a welcome one at that – towards higher cocoa content milk chocolate and the disclosure of that cocoa content. At 37% this is absolutely getting in to richer milk territory but not even close to some of the darker milk so don’t worry. Also this 37% bar is well below the 65% supermilk from Hotel Chocolat and well below Duffy’s 55% Ocumare and 61% Mayan Red. So darker milk but still firmly a light milk chocolate. Given the development specifically designed towards improving flavour I am unsurprised this won a medal at the AoC Awards. It’s a pretty delightful milk chocolate but far frokm standard – however I’d like this to *become* standard. Mint Crisp – Also a richer, darker (so to speak) 37% milk chocolate, this mint crisp bar is probably the one I remember most from judging. Having a higher cocoa milk chocolate is absolutely a wonderful thing but I feel like there might have been a slightly over-enthusiastic hand that added the mint. When I had this one, I likened it to a Polo Mint in a chocolate bar and knew it was an instant popular hit. It may not be an award-winner but I know this is going to have masses of street appeal because of the intense minty flavour. I’m not exaggerating when I say it was like eating a Polo Mint in chocolate form though. Salted Caramel – I suppose butterscotch will never die but the trend towards salted caramel makes it hard to ignore. Everythinhg seems to be salted caramel these days and I suppose G&B couldn’t ignore it any longer – especially after Divine released two bars with a palm oil free caramel. Sadly this bar is not palm oil free but it is an award-winner. However of all the bars I tried it was my least favourite. I found that, to me, there was a slightly artificial flavoured edge to the salted caramel in the first batch but this calmed in later batches. It was likely just to me though as it has won an award but there was an intense edge of a caramel additive which is sometimes used to help enhance the flavour of caramel so you can taste it. It is a natural flavour however and so there is nothing wrong with it but for me it just was not right in that first batch so I was pleased to try it again and find that the flavour had been toned down a lot. If you are a milk and salted caramel fan though you really should give this bar a try yourself. Dark 70% – I was surprised how highly this bar scored in the judging but I shouldn’t have been. For quite some time G&B have been investing in the Dominican Republic in the cocoa growing areas there and it shows. Some of the natural unique quality of the Trinitario beans growing there has started to shine through in this dark bar, giving it better qualities and some unique characteristics that we usually only find in artisan bars. It is great to see a “mass market” bar forge ahead and claim a silver at the AoC awards because of long-term investment, development and innovation in bar shape. The flavours really come through from the origin beans which might surprise you from a company which is owned by a global powerhouse and yet there it is – the hint of dried red fruits. Love it! So there you have it – the whole suite of new Green and Blacks bars. I may have slightly cheated by having tried them during judging but now they are on the shelves you can too. Why not buy a bar and have a try? Would you like to try all four new bars? Well, I will ship a set of the new bars anywhere in the world to you so you can try them. Just check Rafflecoptor for all the different ways to enter including the one required one which is to leave a comment of more than 10 words describing how you would indulge in these bars – whether on the couch with tea and TV, on the beach or in the park, just make sure the comment is more than 10 words long. I would intend to eat these slowly, with a cup of tea, saved for days when the painkillers stop working. In reality I’d have to eat them pretty quickly before my family snaffled them all! I like to ‘mermaid’ which involves a big bubble bath, a good book and maybe a bar of bean to bar chocolate and float and relax for at least an hour – of course chocolate is a key element to this process! I have a confession. I bought a bar of the mint the other day and fell in love with it. I’ve not tried the others though so would of course love to do so and would savour them slowly whilst trying to identify the various flavours and textures. Maybe I should be more attention when browsing for Chocolate because these new bars have totally slipped under my radar! If there’s a new Salted Caramel bar on the block then I have to have it. I’m more than likely to sneak away and find a nice quiet spot and savour every salty mouthful and totally lie to my wife about where I’ve been and what I’ve been doing!! Don’t get me wrong, I’m not in the habit of lying to my wife and I’d share any of the other bars but the Salted Caramel is all for me! 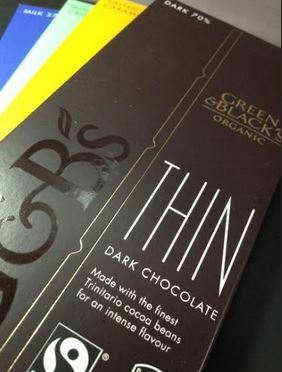 I haven’t had Green & Blacks in a while but that dark chocolate sounds lovely, so definitely worth another dip into their range. I’d share the rest with my family on our next film night on the sofa. I would run a hot bath with my fav bubbles, light a candle or two, put some music on and bask in the warm bubbles with an indulgent treat of Greens and Black. Sat on the sofa with a cup of hot strong black coffee! A match made in heaven! I would indulge in these while relaxing on the sofa after a training run. A little of what you fancy does you good! These bars are definitely an indulgence, I would make sure I was alone so I wouldn’t have to share them, and relax with a book and a cup of tea. Need some now! I would sit on my bed watching community eating them one by one. Maybe possibly sharing with my boyfriend, but that’s a maybe! I would share these with my husband on the couch while watching a film. Can’t beat a lazy evening after a hard day at work! Lying in the Garden relaxing in the amazing weather, enjoying my chocolate the way everyone should. I would definitely have to hide these from my daughter, as she adores Green & Blacks and would scoff the lot before I even had a look! Saying that, I’m a good Mum, so I would share with her when we are watching a good old movie on a rainy day. Sitting in the lounge in the sun with a cup of tea in my hands would be the perfect place to indulge! Late vintage port and Green & Blacks sitting with my other half in the garden on a balmy summer evening by candlelight. I would indulge in these as a very welcome treat in the library while doing uni revision, if these little slabs of loveliness don’t make studying more bearable… Nothing will! Chocolate bar is very popular and small kind of chocolate version. It’s rich with caramels, mint, and milk and that are also used for dark chocolate. Nice Post!! !